Each year, airports spend millions of dollars improving the passenger experience. But despite luxury lounges, gourmet restaurants and high-end retail stores, many still share a common Achilles' heel: security checkpoints. Passenger grumbling has grown noticeably louder at facilities where traffic volume continues to rise and TSA staffing levels remain unchanged due to budget constraints. Miami International Airport (MIA), which served more than 44 million travelers last year, is addressing checkpoint complaints within its control by focusing on visitor comfort and hygiene. Last fall, the airport began installing antimicrobial mats throughout its screening areas. Now, with more than 400 protective mats in place, its passengers don't have to step on cold, public floors after they remove their shoes for screening. "The antimicrobial mats at our checkpoints are the latest way that we are improving the travel experience for our departing passengers," says Miami-Dade Aviation Director Emilio T. Gonzaléz. "The mats and other enhancements at MIA are in direct response to their feedback, as we strive to deliver the world-class level of service our passengers deserve." 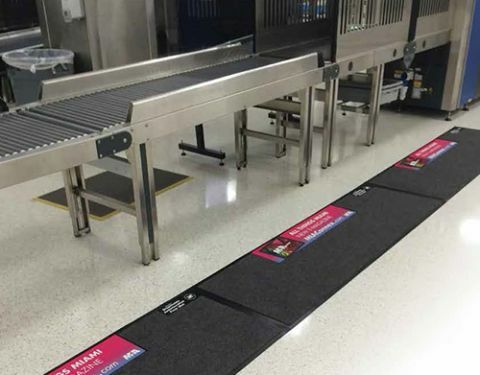 The 2-by-6-foot floor runners begin where travelers place their shoes and personal carry-on items in bins for screening, and they span the entire length of the conveyor belt. The airport also has mats in front of body scanners and near benches passengers use when putting their shoes back on and packing away loose items collected from the bins. Gregory C. Owens, MIA's assistant director of business retention and development, notes that the airport didn't install the mats because its floors were actually dirty; it added the extra measure because some passengers perceived the floors to be unsanitary. "Here in South Florida, few people wear socks," Owens relates, noting that many travelers consequently pass through security checkpoints barefoot-much to the chagrin of other passengers. BellaMat(tm), the company that provides MIA's new checkpoint runners, bundles the cost of daily maintenance into the purchase price of the mats and contracts a janitorial company to clean them every evening. "They clean, vacuum and wipe down all the fill to retain the antimicrobial benefits," explains BellaMat President Cynthia Lazarus. "We are responsible for placing the mats and then taking them up and replacing them. If something comes loose on the floor, the mats are replaced. If they are soiled, new mats are installed. The mats are always pristine and taken care of." According to Lazarus, the standard lifecycle for each 2-by-6-foot mat is three months. Crews adhere the mats to hard surface floors with water-soluble, double-stick tape, and to carpeting with hook and loop fastening. MIA notes that it hasn't received any reports of slips or falls due to the mats, which are compliant with the Americans with Disability Act. "This is in an area where you're not making huge steps," Owens comments. "You're taking small steps because you're waiting. You're waiting for your personal items to come through the machines, so everyone walks with extreme caution in this area." The patent-protected mats, which have antimicrobial properties blown into their structure, took several years to develop. The idea came from Lazarus' personal experience in checkpoint lines. "After 9/11, security changed at airports," she recalls. "I'm a high-heeled lady, and I hated taking my shoes off and walking on bare floors. If there was any water on the floor, I stepped into it. If there was gum on the floor, I stepped on it." Because the mats are made from recycled soda bottles, they are not only environmentally friendly, they are also lighter than traditional woven mats, adds Lazarus. The mats themselves are fully recyclable as well. "They can be placed directly in the recycling container when replaced," she notes. Although nearly a dozen U.S. airports use BellaMat products, MIA is currently the only one leveraging their promotional capabilities. When its first mats arrived in October, the airport opted to run an "in-house ad" on them, thanking travelers for selecting MIA. The second set, installed in January, promotes MIA's electronic magazine. Currently, the airport is looking for outside companies to run paid ads on the mats. "If an airport gets an advertiser, the cost of the mat to the airport is basically zero," Lazarus explains. "And the quality of the advertising film is terrific. The colors are rich and vibrant." Airports can improve the passenger experience by increasing customer comfort, while offsetting the cost of the mats with advertising, she elaborates. "More than anything, advertisers value captive space for advertising brand messages. On average, passengers spend 10 minutes in airport security. That's 10 minutes of exclusive exposure to (a) brand message. And, the bigger the airport, the more eyeballs and, thus, the more value." According to Lazarus, independent research conducted two years ago found that advertising on BellaMat products improves brand awareness, message communication and purchase intent. "We were able to prove that we can generate significant brand awareness and purchase intent on the part of the passengers," she reports. Lazarus also notes that checkpoint mats don't interrupt consumers, as many traditional media do. Furthermore, the positive feelings generated by the mats' antimicrobial benefits accrue to the brands advertised on them, further driving positive perceptions, she adds. MIA has validated the company's customer benefit claims. "The mats are in place, and people feel a little more comfortable walking on the mats with their bare feet as opposed to walking on the floor or on something that is not sanitized," reports Owen. Overall, the airport is "extremely happy" with the mats, adds Gonzaléz. "They are serving as a customer service for our passengers, and the additional space to notify travelers about our digital magazine, MIA Connections, is an added bonus."